Noted architects Warren and Wetmore built the historic landmark Omni Berkshire Place in 1926. This AAA Four Diamond hotel boasts 395 guestrooms and suites, all luxuriously appointed with rich bedding and Italian marble baths. Soothing paint and rug colors, paired with classic artwork and mirrors, produce a plush environment while the new sleek English sycamore wood furniture and desks provide clean lines in the spacious rooms that are ideal for tending to work or relaxing tuned into new high definition 42-inch flat-screen televisions. Pet-friendly and ADA-accessible rooms are available upon request. The Omni Berkshire has 11 meeting rooms and a total of 7,000 sq ft of versatile space, ideal for business meetings, weddings, and other special occasions. The event planning team and tech team will work together to make sure everything runs smoothly on the big day and even be available the day of, in case anything should go awry. 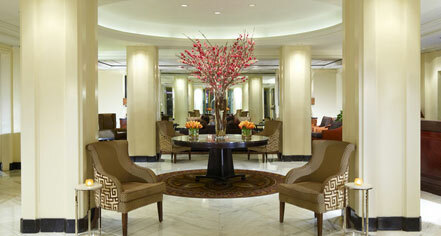 Best of all, free WiFi is modernly available throughout the historic Manhattan hotel. 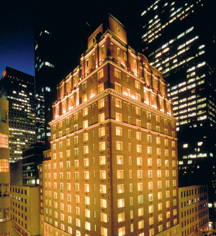 Omni Berkshire Place, New York City, a member of Historic Hotels Worldwide since 2014, dates back to 1926. In 1942, Rodgers and Hammerstein collaborated on the landmark American musical “Oklahoma!” in suite 2100. Airport Transportation: Available via concierge. Cancellation Policy: 24s, 1 night room and tax. Early Check-In/Late Check-Out: Late check-out up to 4:00 p.m. may be available for an additional charge. Add on to your reservation as an enhancement or check with the front desk at check-in. Hotel/Resort Fees & Taxes: Taxes: 14.25%. Payment: Cash-paying Guests: A credit card is required to reserve a room. Guests wishing to pay for their stay with cash will need to pay for their stay in full plus $50 per day incidental deposit at time of check-in. Debit Card Policy: The use of a debit card will initiate, at the time of check-in, an immediate deduction from your bank account for your room rate, inclusive of tax, for all room nights plus $50 per night for incidentals. Upon check-out, any unused funds will be credited back to your account. Based upon the business rules of your bank, it may take 72 hours or longer for your bank to process this back to your account. Accepted Card: MasterCard, Visa, Amex, Discover, and Diners Club. Pet Policy: Service animals allowed: Yes. Pets allowed: Yes. Restrictions: Dogs and Cats Only. Maximum weight: 25 lbs. Maximum amount: 1 pet per room (more if preapproved). Fees: $75 (nonrefundable cleaning per stay per room). Other: Extreme or wild animals are not authorized. Service animals are exempt from fee and weight limit. Rollaways: Available upon request; $45 per night. Noted architects Warren and Wetmore built the historic landmark Omni Berkshire Place in 1926. This AAA Four Diamond hotel boasts 395 guestrooms and suites, all luxuriously appointed with rich bedding and Italian marble baths. Learn more about the History of Omni Berkshire Place, New York City .